When was the last time that you had a positive, memorable customer service experience at a bank, store, laundry or other organization? In an age when technology-based service dominates many aspects of business, many organizations have lost the ability to make customers feel special and appreciated. Smart managers and their organizations can separate themselves from the pack by focusing on old-time customer service. When all employees are trained in the skills necessary for creating and maintaining strong interpersonal relationships with customers, companies can take a lead from their competition. That is because building customer relationships leads to customer satisfaction. To be successful in creating a stellar customer service environment, organizations must prove that they are customer-centric. Customer service must become a strategic initiative driven from the top and practiced by all. Employees at all levels must be trained and held accountable for making customers feel valued. Service in such organizations is a standard, not an exception provided by a few. The following are strategies that each employee can use for building customer relationships. Communicate effectively. With so much communication occurring during any given day via technology, many people are forgetting how to effectively communicate with one another face-to-face or over the telephone. Sound verbal and nonverbal communication, coupled with active listening skills, are the keys to any successful interpersonal relationship. This is especially true in a customer service environment where building customer relationships often determines whether someone makes a purchase and shares their positive experience with others or goes away dissatisfied and spreads that message. Through corporate training sessions, online courses and videos, professional development events, articles and books, there is a plethora of information on how to better communicate with others. Each employee should take responsibility for enhancing and honing the communication skills necessary for building customer relationships. Emphasize the value. It does not matter whether you are selling products, services or both. When you come into contact with a customer or potential customer, you must share reasons why what you offer is the best possible alternative. Your goal is to show that you can meet the needs, wants and expectations of your customers. A rule of successful sales is to sell the benefits, not the features of you offerings. Show the customer why they should choose what you offer over that of a competitor. This can be challenging in a world where your competition is only a mouse click away. Often, your competitors might offer discounts or sell at a lower rate. The differentiator can be that the service and effort you put forth in building customer relationships exceed that of your competition. Think of a time when you paid a bit more for something because you liked the way an employee made you feel during an interaction. Now take that feeling and put it into action for your customers. Go a little further to listen, respond in a friendly manner and make the customer feel valued. Maintain a flexible stance. Before you ever encounter a customer, make sure that you discuss with your supervisor the level of decision making that you have when it comes to satisfying a customer. Often, organizations that empower front line employees to take extra steps to satisfy a customer are the ones that succeed in building customer relationships. They have lower customer churn rates and higher levels of brand and customer satisfaction. Capitalize on complaints. Many people fear feedback and often do not ask for it. This is likely based on relationships they have maintained in the past and how they were made to feel. In a service environment, you should always ask for and graciously accept all customer feedback. Look at it as a way to improve yourself, your organization and the way that you deliver service in the future. You can gather feedback at the end of customer interactions, if other customers will not be kept waiting. Take the time to ask if there was anything else that you might have done to make the customer’s experience more positive. Thank them for any feedback that they provide. After they have gone, think of whether there is a way to implement their suggestions. Share these ideas with your supervisor and peers so that all employees benefit. Building customer relationships is not difficult. It just takes practice and a determination to put forth the effort required to exceed your customers expectations. To get additional ideas on ways to enhance customer experiences in the future, search this blog for other articles on topics on which you have an interest or area in which you need to grow. 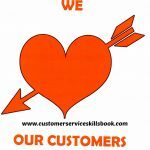 Also, check out Customer Service Skills for Success, Please Every Customer: Delivering Stellar Customer Service Across Cultures and the AMA training course – How to Be Great Call Center Representative. What suggestions can you offer other readers related to how to build stronger customer relationships? Share them in the comments section. This entry was posted in customer relationship management, customer satisfaction, Customer Service and tagged building strong customer relationships, creating stellar customer service experiences, customer relationships lead to customer satisfaction. Bookmark the permalink.